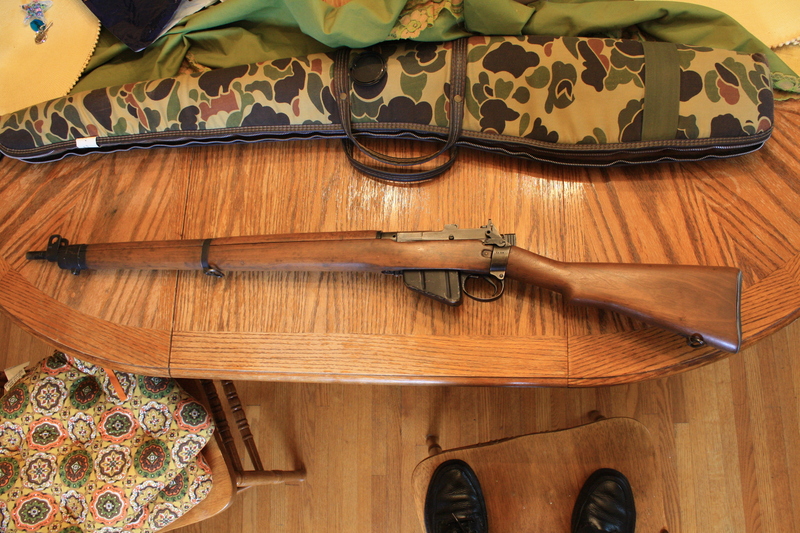 I made the plunge and purchased a piece of history from a friend who is a avid firearms collector and a gunsmith, a Lee-Enfield .303 No. 4 Mark I service rifle. I’m still trying to narrow down the meanings behind the many markings upon the weapon, but several internet sites seem to have varying levels of guidance. Mainly I’m trying to narrow down the date and place of manufacture, in addition to identifying any associated military unit marks where the rifle may have been in service. It is a fascinating task to delve into history to identify the particulars of such a piece. Front metal cap bottom – S.M. Craft Project . . . of Doom! There are additional photos here. I’ve been shooting my AR-15 (pictured below in my earlier entry) at a local outdoor public range which is useful due to distance, functional covered shooting benches, and the fact they have berm backstops at 50, 100, and 200 yards. The only problem with this range is that it is a bring your own target kind of place. I don’t mind stapling a paper target to a cardboard box as a stopgap measure, but I decided I wanted to build a lightweight, and portable target frame to staple paper targets to, or to hang steel targets from for a variety of shooting purposes. 12 feet of 2 inch PVC pipe cut into four 2 foot sections and four 1 foot sections. Two 2 x 2 x 2 inch PVC tee connectors. Four 2 x 2 inch PVC 90 degree elbow connectors. Two 8 foot long 2×2 boards each cut into a 5.5 foot piece and a 2.5 foot piece. Six 4 inch eye hooks. Six washers to fit eye hooks. Cable Wire 10 feet in length. Fourteen 2 inch galvanized wood screws. The pictures can be examined to determine the assembly, but it basically consists of dry fitting the PVC into a rectangular base with the tee connectors along the long side with the shorter 1 foot pieces of PVC pipe on the front and top parts of the connectors. The wood screws are used instead of PVC cement on the base to ensure the ability to disassemble the base in case a piece is damaged during use or transport. Pre-drilling the holes in a smaller diameter than the screws ensures an easy assembly, with a solid fit. The 5.5 foot long sections of 2×2 are inserted into the top parts of the pipe up from the tee connector. Next a hole is drilled into the top portion of the longer 2×2 boards to accommodate the first two eye hooks. Then one of the 2.5 foot 2×2 boards is used as a top cross brace, and it has two holes drilled to match the openings in the eye hooks inserted into the longer 2×2 boards. Then two more eye hooks are placed through the eye hooks in the longer 2×2 boards, and then through the cross brace. All eye hooks are secured by bolts and washers. The final two eye hooks are placed through holes drilled through the upper part of the 2 inch tee connector. This acts as the resting point for the base of the longer 2×2 boards when they are inserted into the upper pipe sections. The last piece is the 10 foot cable which is first tied to one of the lower eye hooks secured through to the PVC tee connector. Then the cable is threaded through the upper eye hook on the same side, followed by whatever hanging target you intend to use. Next the cable goes through the eye hook on the opposite upper end, and finally is brought down and tied off at the lower eye hook on the side opposite from where it began. 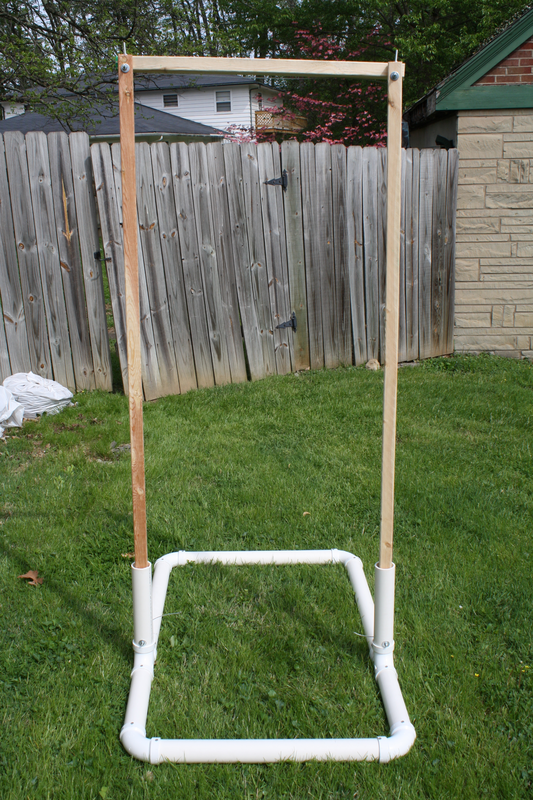 The upright posts can have cardboard backer material then stapled to them, and paper targets can be subsequently stapled to the cardboard hung between the posts. I like the steel cable being behind this point because it makes it easy to adjust the position of any hanging steel gong target to directly behind the sweet spot on the paper target. Not only will I get a record of where my shots are landing from the paper target, but I should also get a nice ring from the steel gong target hanging behind every time my shots are in the black. It was a night of insomnia with me waking up thinking of thousands of things. I needed a project to occupy my mind since sleep was silently sulking from my presence. Time to get out three of my “toys” from my way too many hobbies and diversions. Toy number one is my Canon Rebel XS digital SLR camera. I used it to take a cleaner picture of my Toy number two above the Blackheart International BHI-15. 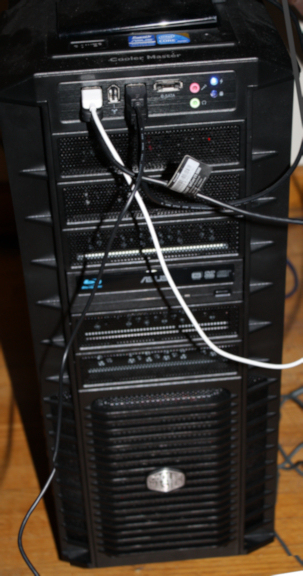 Then I used my Toy number three my self assembled computer system I’m using for both personal work and play. The Myth/Logic Press power center. I would have put up a picture of toy number one, but without tricks using a mirror or another readily on hand camera it’s hard to take a photo of a camera you’re using to take pictures easily. I would go with the mirror method, but I’m not dressed at this early hour and don’t want pics of me unshaven loitering in my bathrobe floating around the internet. 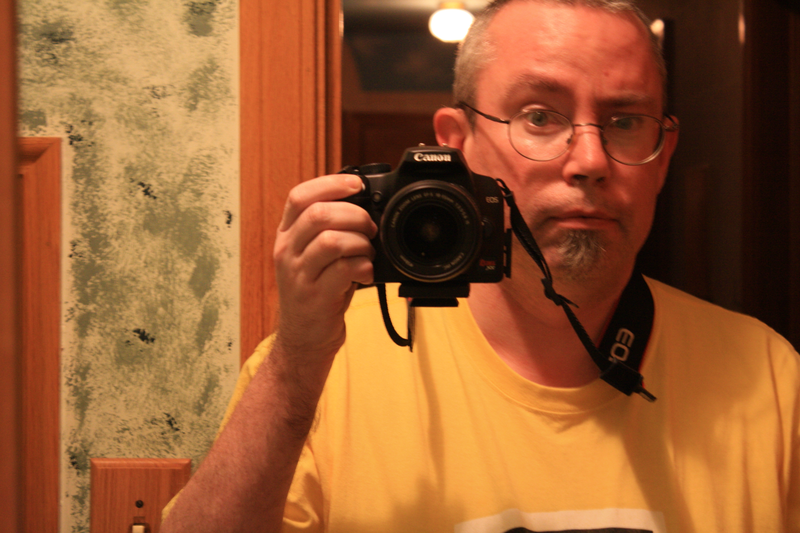 Update: the somewhat late picture of Me and My Canon Camera. What does this all mean? It’s too early to tell. No seriously its like 3:10 am and my thinking processes are suspect at best at this hour. This is the fun time where I can bounce some ideas around in my head, but when I don’t trust my judgement enough to write on my next novel. Ah, but here is where the joys of blogging on the internet come in play. It lets me write as a creative outlet, yet not worry that this page or my late night insomnia driven obsession to photograph a firearm and a computer would be exposed to too many people. Trust me I look at my site stats and anything off the main page has a distant chance of being seen by anyone at best. Is there an eventual point here? Yes, for anyone intrepid enough to get this far. I’m writing about my experience. My experience of having thoughts swirling late at night until I can’t sleep. My experience of going with my obsessive instinct to take that photo which is disturbing my thoughts. This is fodder for future characterizations. An author shouldn’t be afraid to mine their own idiosyncratic behavior for ideas. The author is the person they know best after all.